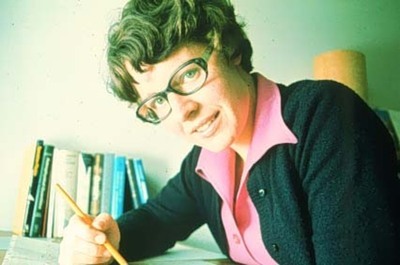 Dame Jocelyn Bell Burnell detected the first four pulsars in 1967 while a research assistant at the University of Cambridge. The pulsars appeared as an appendix to her Ph.D. thesis. Under the supervision of Antony Hewish, she constructed and from July 1967 operated a 81.5-megahertz radio telescope and studied interplanetary scintillation of compact radio sources.
" I found a second pulsar, killing the L(ittle)G(ree)M(en) hypothesis and indicating a new kind of astronomical source." Each complete coverage of the sky required four days. Bell Burnell then had to analyse about 122m of paper chart, the signal of the pulsar occupying about 7mm. The paper announcing the discovery had five authors, Hewish's name being listed first, Bell's second. In 1967 Martin Ryle and Tony Hewish were jointly awarded the Nobel Prize in physics, with Hewish honoured for the discovery of pulsars. This was the first time the prize was given for work in observational astronomy. The failure to name Bell as a co-recipient was controversial. Burnell, J. 2004. So few pulsars, so few women. Science 304: 5670: 489 . World Changing Project, "Discovery of pulsars," in University of Glasgow World Changing (University of Glasgow, 2010); http://www.worldchanging.glasgow.ac.uk/article/?id=31 (accessed April 23, 2019). World Changing Project. "Discovery of pulsars." In University of Glasgow World Changing. University of Glasgow, 2010. http://www.worldchanging.glasgow.ac.uk/article/?id=31 (accessed April 23, 2019). World Changing Project. "Discovery of pulsars." University of Glasgow World Changing. University of Glasgow, 2010. 23 April 2019 <http://www.worldchanging.glasgow.ac.uk/article/?id=31>.